This weekend, from 9:45 this evening (Friday, November 23) to 5:00 AM Monday, November 26 there will be no service from High Street to Manhattan, as Manhattan bound A and C trains will be diverted to the F line between Jay Street-MetroTech and West 4th Street. All other trains serving local stations should be running normally, except that on Saturday and Sunday 2 trains will be running every twelve minutes. The following work week, each night Monday, November 26 to Friday, November 30 from 10:45 PM to 5:00 AM there will be no Manhattan bound service at York Street in DUMBO, as F trains will be diverted to the A/C line between Jay Street and West 4th. To reach the LES stops on the F, take an A or F from High Street to West 4th, and take a Brooklyn bound F from there. 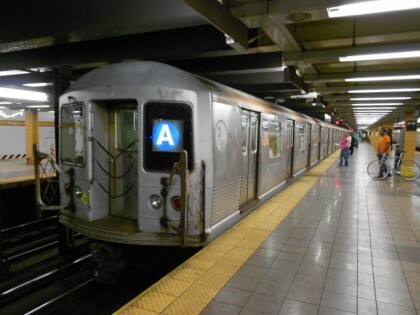 Each night Monday to Thursday from 9:45 PM to 11:45 PM 3 trains will not ber running in either direction below Times Square, but 2 and 4 trains will provide alternative service.